DIRECTOR Alexandre Aja's films have been so mired in controversy that no one seems to notice how personal they are. The arguments over whether he should or shouldn't have chosen a twist ending here or a remake there, or whatever else, have completely defined his career so far. The result can be seen in the reaction to his latest film, Mirrors, which many fans are complaining is nothing like his previous work. Meanwhile his critics, some of them at least, are celebrating the same thing. Neither camps has looked deeply enough at his work, because Mirrors builds on the exact same themes Aja has been exploring for several years now. And like all of the most interesting horror directors, it's not the surface scares but the deeper implications of his films that make them fascinating.To a certain extent, this is the fault of Aja himself as much as his audiences. His debut, High Tension, was like the Matrix of horror films—so audacious, so different and so visually engaging that it felt like pure style over substance. Some argued that the twist ruined a perfectly good standard slasher movie, but obviously he had no interest in making one of those. And as Mirrors proves, he still doesn't. His new subplot about a forgotten landscape of disturbing U.S. history was the best part of an otherwise underwhelming remake of The Hills Have Eyes, and he's developed his twin obsessions of madness and paranoia further with Mirrors, based on the 2003 Korean film Geoul Sokeuro. While Mirrors isn't a great film, maybe, it's my favorite of the Hollywood Asian horror remakes. Aside from one well-done gore scene, Aja's latest is closer to the psychological and extremely Freudian horror of Jacob's Ladder than to the current crop of Hostel rip-offs currently in vogue. It takes far too long to get going—Kiefer Sutherland plays a cop suspended from the force for getting drunk and going gun crazy on the job, and it's so overplayed I almost expected Sharon Stone to slink around from a dark corner and say "You know all about homicidal impulse, don't you, Shooter?" But the only basic instinct in his new security job at a burned-out New York warehouse is the fear that some unseen evil force is stalking him. He begins to think it's something in the mirrors, and begins to act like a psycho, freaking out his sister (played by Amy Smart) and his estranged family. The basic themes aren't hard to grasp: Sutherland's cop has demons, the mirror may have demons, as well. And yet, there's much more going on here—Aja obviously chose to remake this film because it nails the central concept he has been toying with all along: the danger of repressed history, and of repressed insanity. Stylistically, Mirrors has plenty of polished surfaces to play around on, sometimes to startling effect. The epic shots of glass and malevolence could be straight out of a Dario Argento film (and are the birds some kind of tribute to John Woo?). There's more than enough here to keep his fans and haters busy until his next project, which—brace yourself—is a 3-D remake of Joe Dante's Piranha. MIRRORS (R; 110 min. 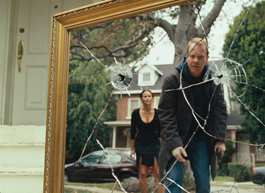 ), directed by Alexandre Aja, written by Aja and Grégory Levasseur, photographed by Mazime Alexandre and starring Kiefer Sutherland, plays valleywide.